How to discover and release the real you! 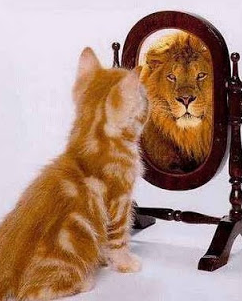 The real YOU is able to change from lion to cat and from sheep to tiger vice versa! Whatever you think of yourself is just what you think of yourself. And this is probably a summary of what you were told as a child and what has been reflected to you by others up to now. And, you probably think, feel and act according to that picture. Obviously, you can change. Step 1 is believing, imaging, feeling the sensation of what you really want. Step 2 is action in moderation, which means, being present, sensitive and compassionate with yourself, not just proceeding a new regime like a soldier fulfilling the lieutenant’ orders. This “action” includes taking time out, contemplating, listening inside. Step 3 is consistency until the new habits become your natural state. Previous postYes, walk, no need to run!! !